What comes to mind when you think about Sumatra? 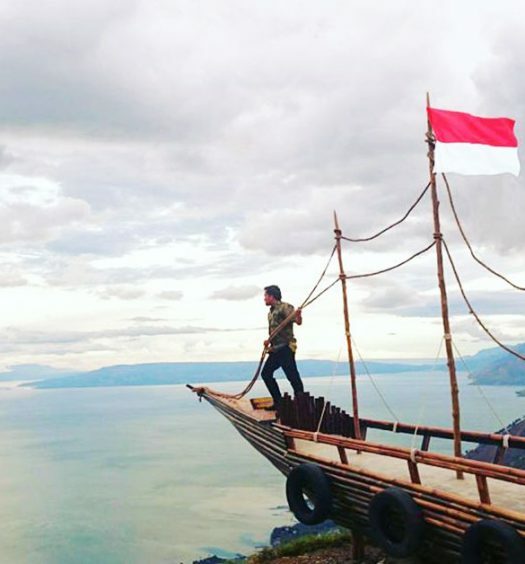 The iconic Lake Toba? 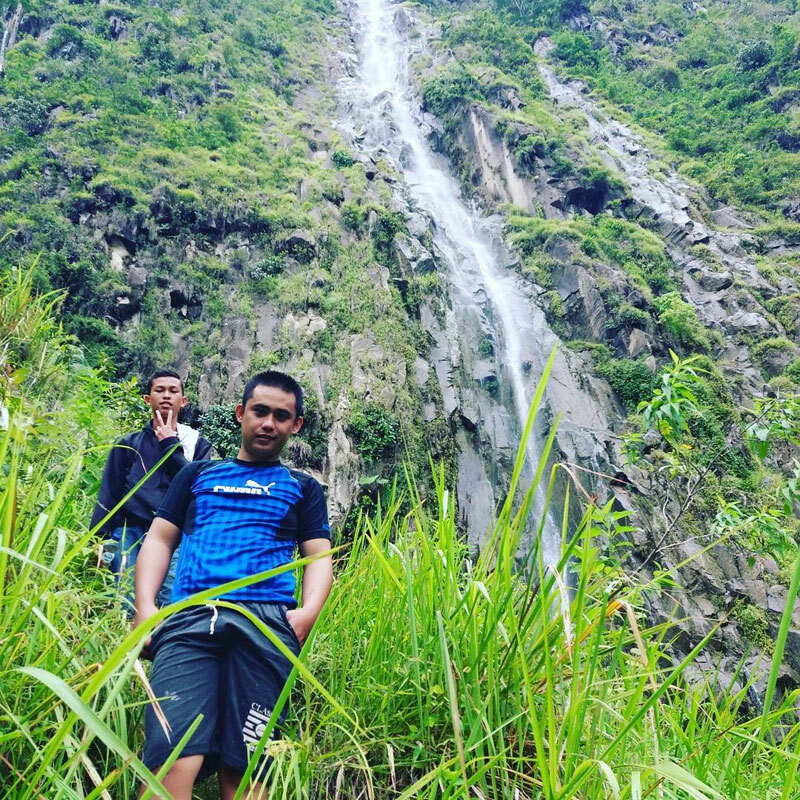 Samosir Island and Sipisopiso Waterfall? 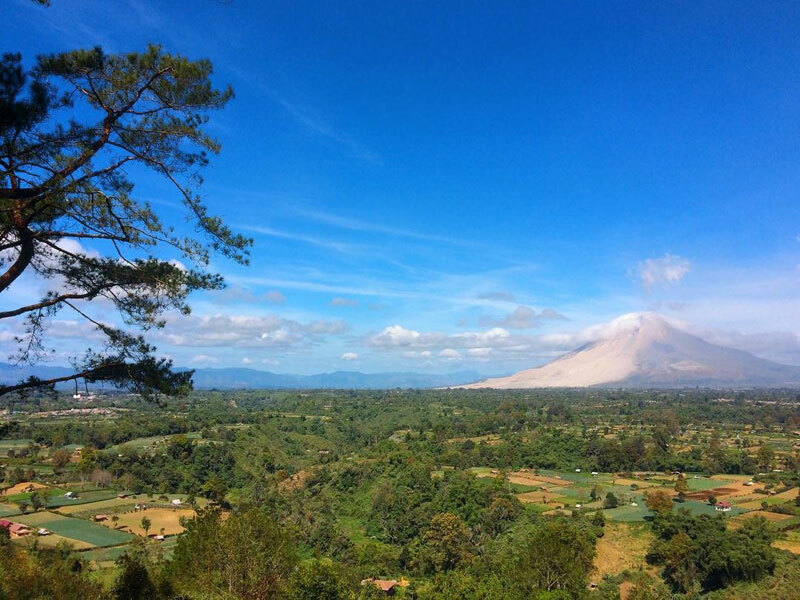 Few travellers know that Sumatra is so much more than its popular natural icons. 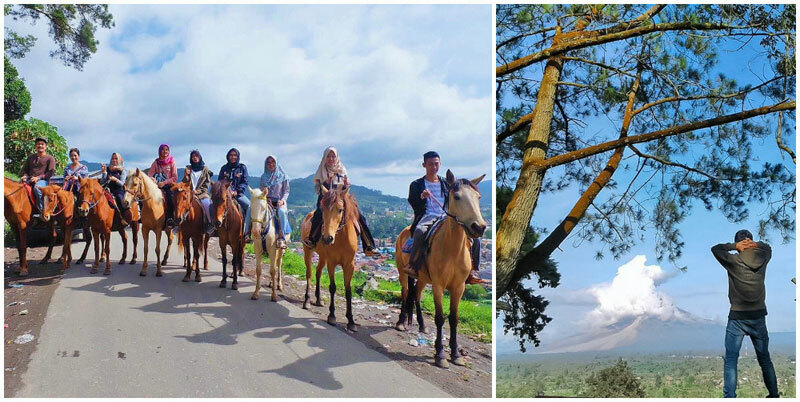 North Sumatra has an abundance of natural attractions all of which are just a few hours from the bustling capital city of Medan. 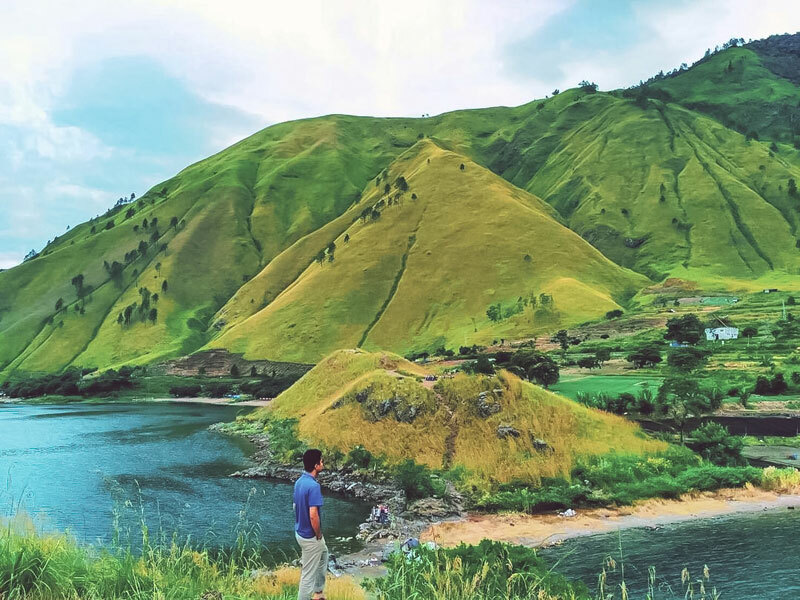 It’s incredible how diverse North Sumatra is, the scenic beauty comes in many forms – mountains, volcanoes, lakes, forests, islands, waterfalls, and more. If you’re curious about the other side of things, where the locals go – the places where the flocks of tourists don’t know, join us as we highlight some of the lesser-known, but no less remarkable, sights of North Sumatra. Medan is generally warm and rainy almost all year round, though you can generally expect the rain to last only a few hours (i.e. in the evenings). Because of this, any time is good for travelling around Medan. 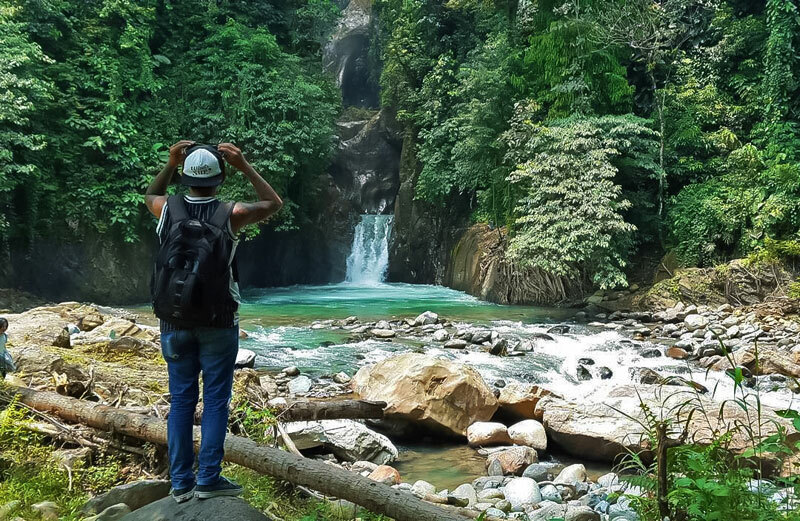 But if you are planning to go on adventurous hikes and treks in North Sumatra, we recommend travelling during the warmer seasons from April to October. Mid April to May is the hottest period, when the temperature can reach up to 40°C. November to late March is the rainy season, though the temperature would generally not dip below 23°C. Avoid travelling during public holidays unless you want to be caught in the traffic jams and crowd! 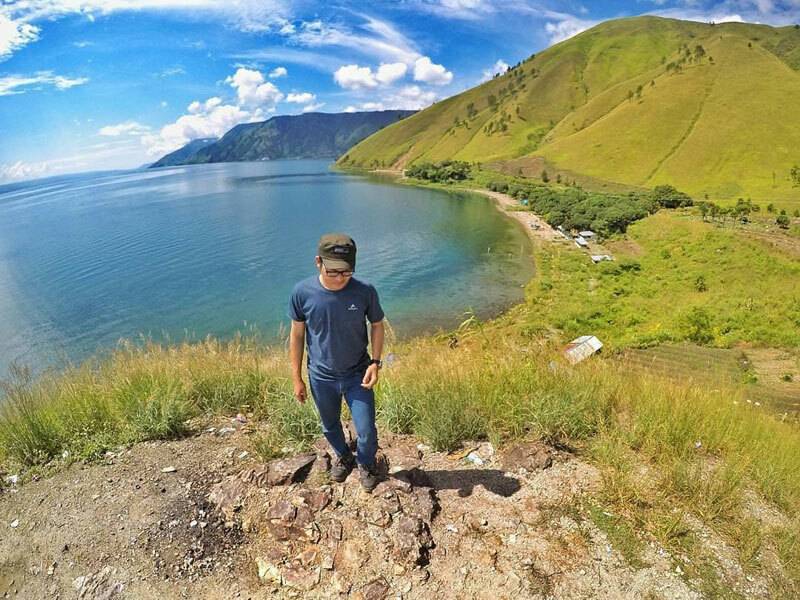 If you plan to travel to Lake Toba area, do remember to check the volcanic activity before going. 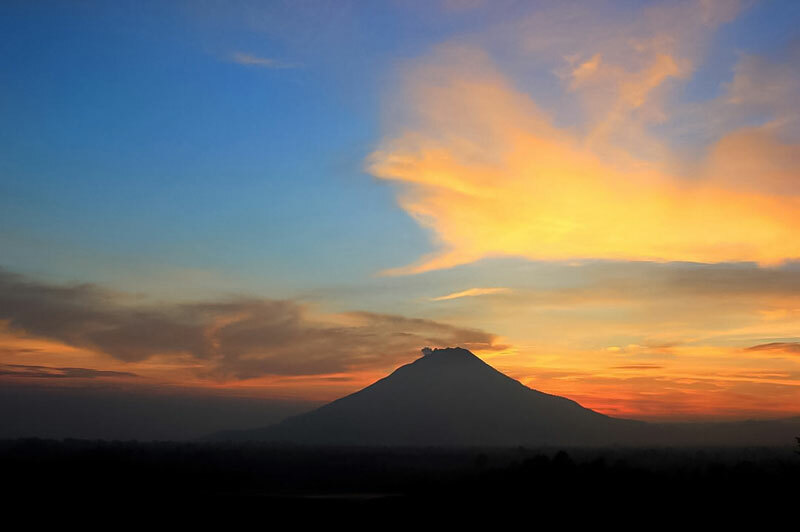 Mount Sibayak has been erupting from time to time, and there have been regular earthquakes due to changes in the climate. So it’s important to check when it’s safe to go! How do I get to Medan? Thanks to Indonesia Tourism Board for making this story possible! For more information, click here and head on to Medan’s official website. 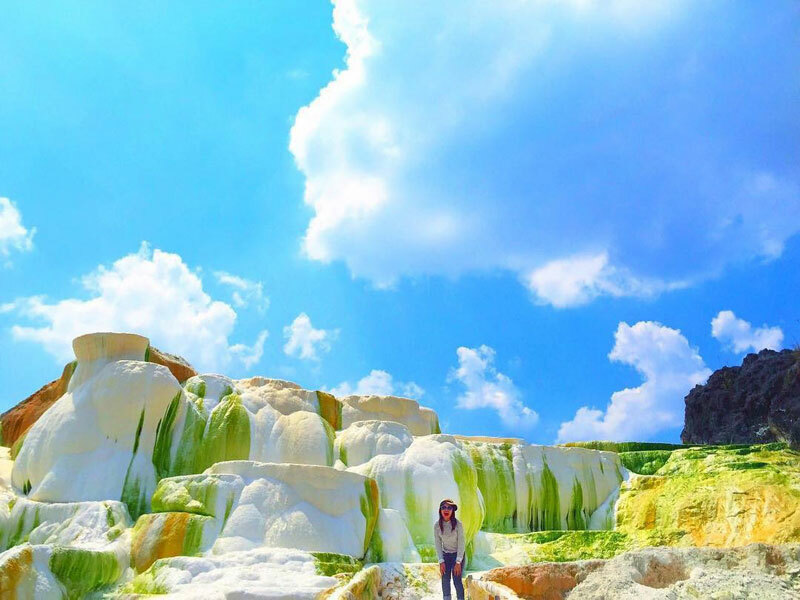 The waters are a vibrant blue-green due to its sulphurous content, and the surrounding limestone hills dot the area with hues of orange, yellow, and green – such a picturesque landscape! 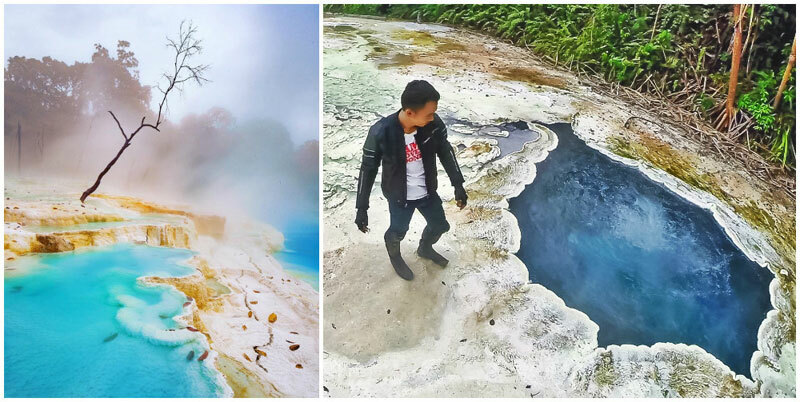 Make sure you bring your swimming suit if you’re keen to bathe in the sulphur-springs pool. 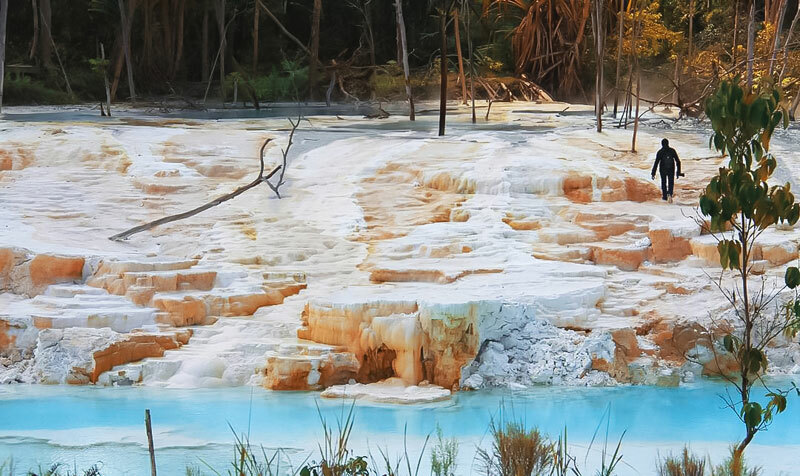 Sulphur is known to for its healthy, healing properties so after dousing in the pools you’ll emerge with a soft radiant glow. CAUTION: Local sources have recently informed us that there are mafias in the area who have been known for making visitors pay exorbitant entrance fees of Rp.200,000-500,000 per person (approximately USD 14-35). If you are carrying heavy equipments such as cameras, there is a risk of robbery as well, though you can get your local guide to help contact the local police to accompany you, but you will need to fork out Rp.2 million (approximately USD 136) to the authorities. We strongly recommend travellers to skip this location. 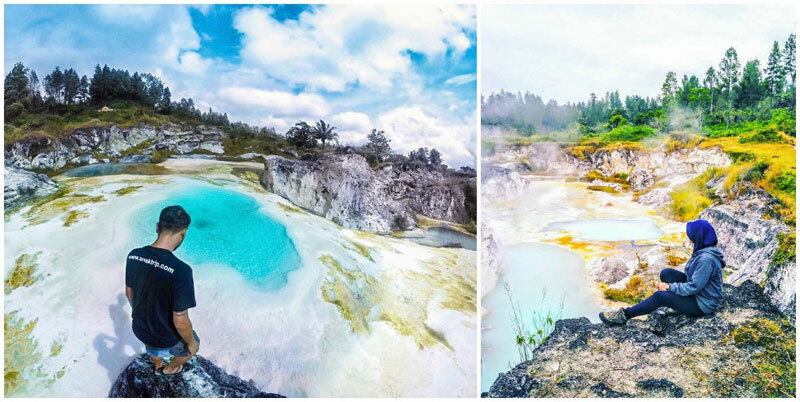 If you’ve travelled to West Java, you’ve probably heard of Kawah Putih, the white crater lake, but did you know that there’s another hidden Kawah Putih located in the middle of a forest in North Sumatra too? 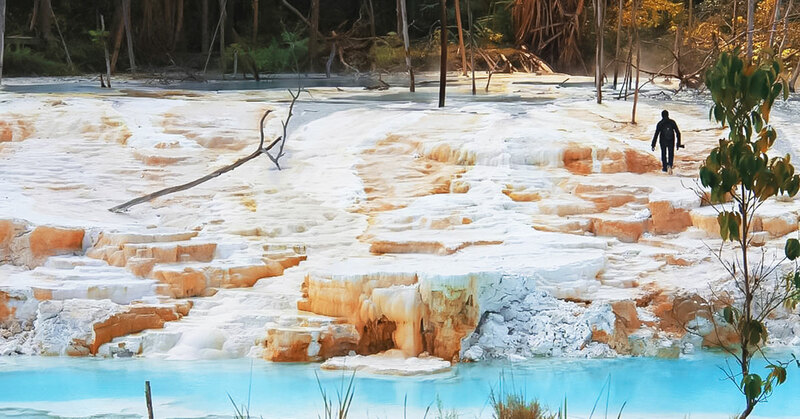 The 90°C water flows down limestone steps, causing the rocks to turn as white as snow. Nearby, this hot snow spectacle is blended with mossy carpets that lie on the imbued rock as well as a large pond that bubbles from beneath the surface. You can actually bathe in a second access point in the reserve due to the cool river water and waterfall that rushes from the hilltop into a pool. Isn’t it a wonderful place to stop by and relax at after exploring the beauty of the hot springs? Don’t let the name fool you. Though this remarkable natural destination is called “Snow Beach”, there isn’t any snow, and it actually isn’t a beach! But this doesn’t make the place any less beautiful. 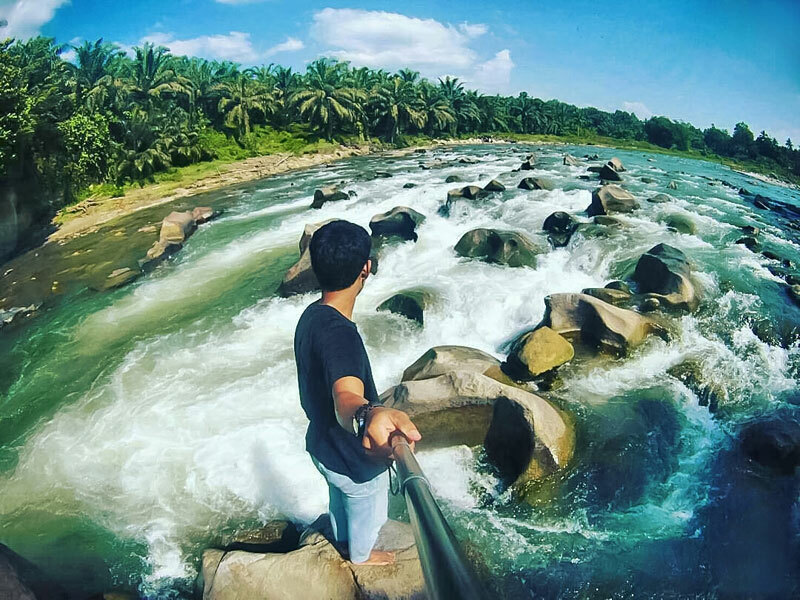 Pantai Salju is a river that rushes over a collection of rocks, with swaying palm trees as the backdrop. As the water breaks on the rock bed, it appears white, and this resembles snow. The water flows from a mountain, so it is clean and cool. Spend a peaceful day here! Getting there: There are two alternative routes you can take from Medan, with a travel time of about 3-4 hours. 2) Medan – Lubuk Pakam – Galang – Dolok Masihul – Dolok Tinggi Raja. Do note that this route can only be taken by motorcyclists due to the narrow roads. 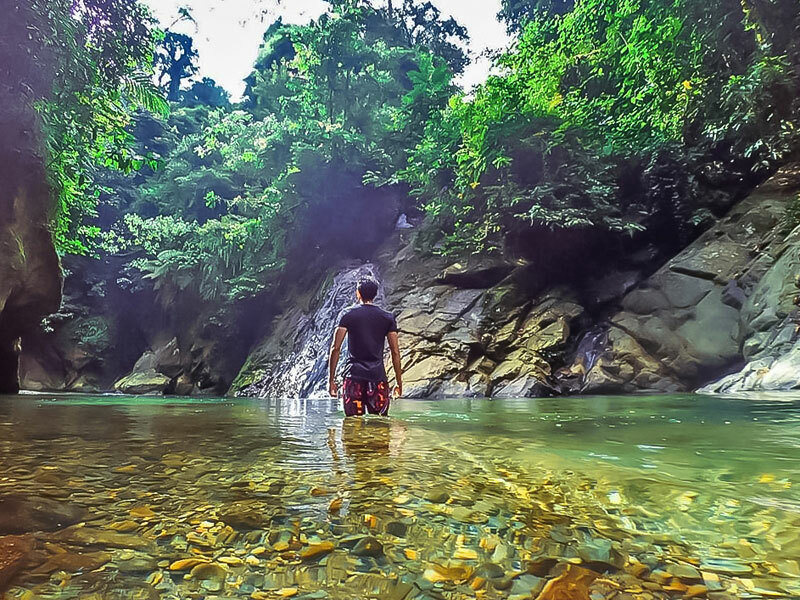 A small village tucked discreetly in the dense forests of Gunung Leuser National Park, Tangkahan is a wonderful, natural space where you can trek through the jungle and bathe happy elephants. Upon entering the village, the world appears to change before you as you travel from the Medan metropolis to calm, serene nature. 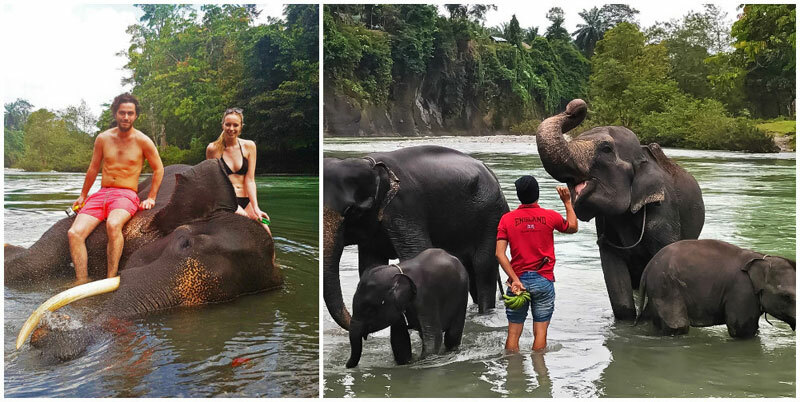 In the park, you’ll find some gorgeous waterfalls where you can swim (or simply laze about) in the clear, clean waters with one of the resident elephants. And guess what, these delightful giants are actually on a job! The elephants of Tangkahan have been trained and are now members of the patrol crew for the National Park to spot illegal activities. In fact, they are seen as protectors of other wild elephants and of the local villages, saving them from poachers and illegal loggers. Getting there: From Medan, head to Stabat City, before proceeding to Seberit Seberang, Batang Serangan, and finally head to Tangkahan. 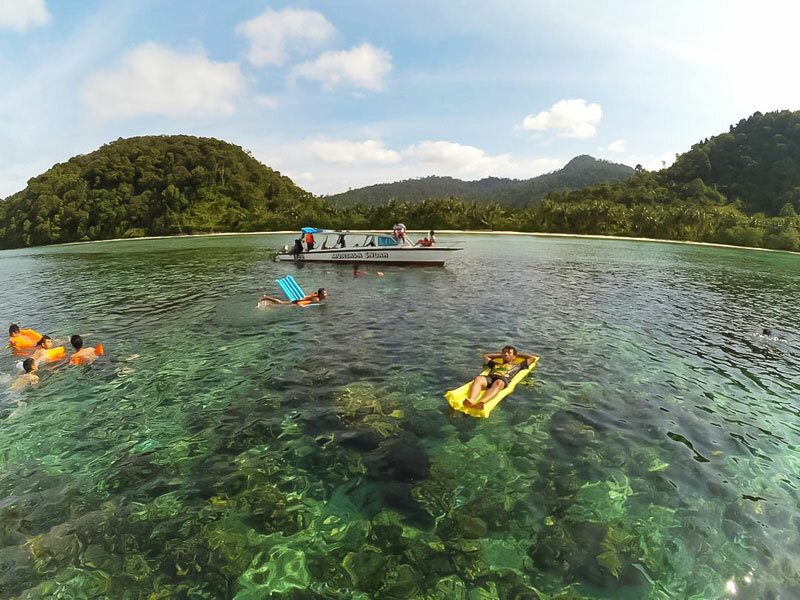 Did you know that there are pristine islands with lush greenery, white sand beaches and clear waters just hours away from Medan? 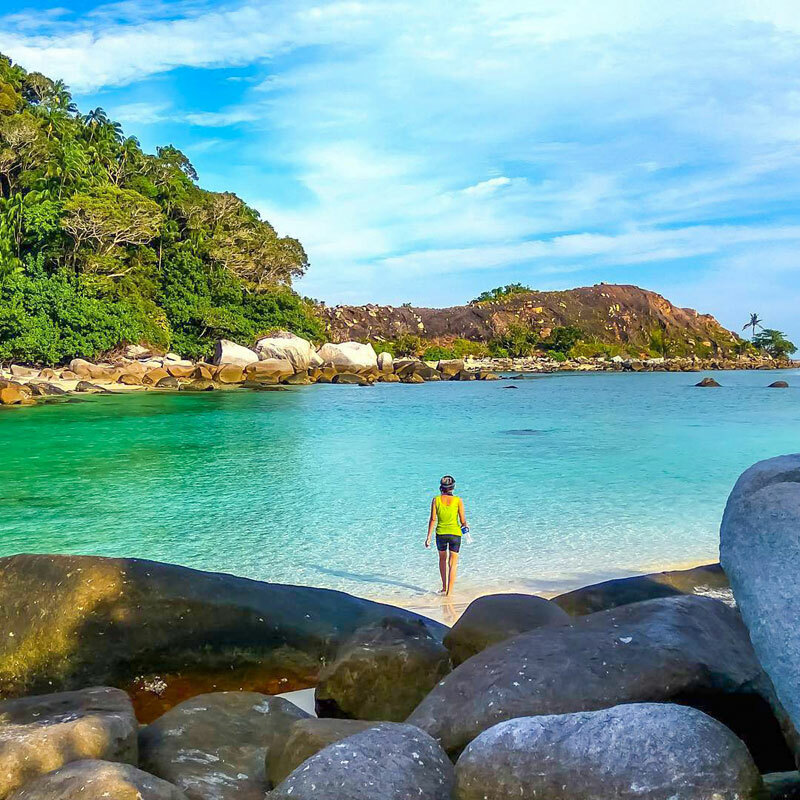 Subtly located off the coast of North Sumatra, just a boat ride away from the Tanjung Tiram port, are the little-known islands of Pandang and Salah Nama. When you arrive at Salah Nama, you’ll notice a footpath that runs along the waterfront with tall, artfully painted ceramic vases. These unexpected artifacts may appear out of place, but they make for a great photo opportunity with the turquoise sea in the background. 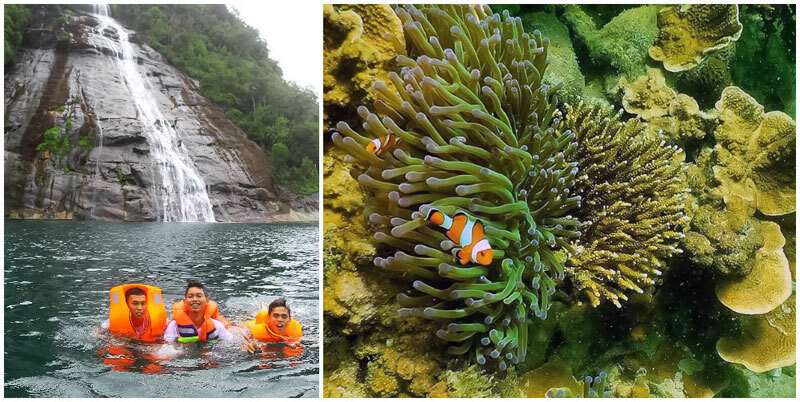 The coastline here is rugged with beautiful, brick-red rocks and crystal clear waters swimming with diverse schools of fish. 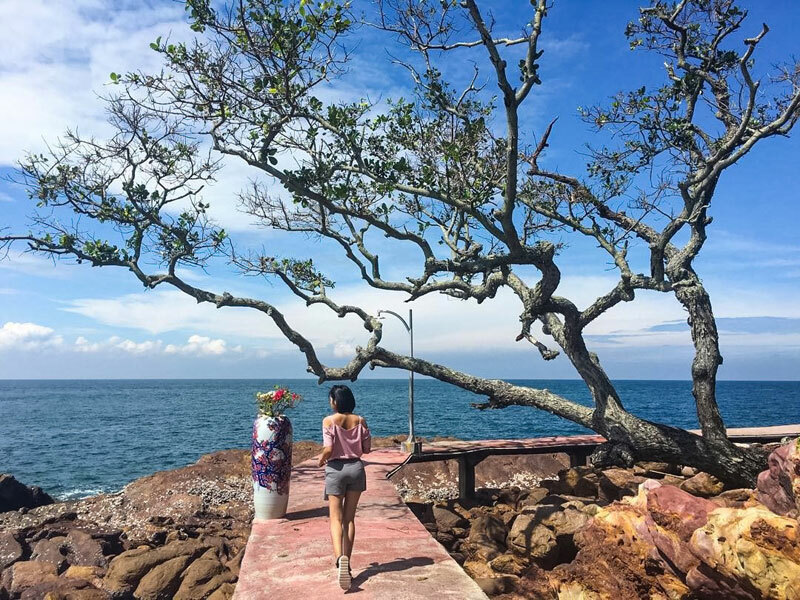 After exploring Salah Nama, head on to Pulau Pandang, where you’ll find white sand beaches and a large castle-like lookout spot from which you can gaze across the island to the sea. Pulau Salah Nama coordinates here. 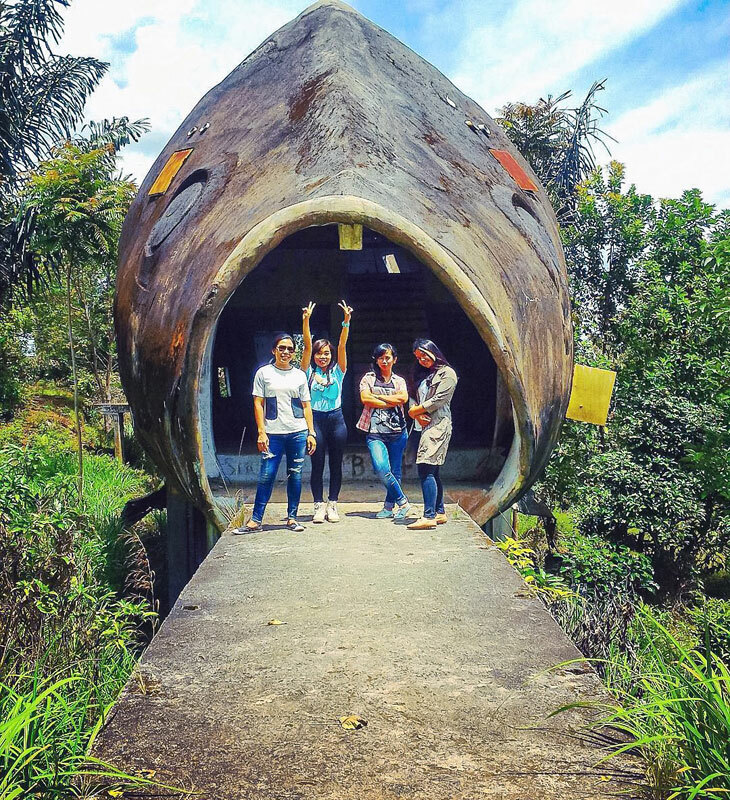 If you’re at Lake Toba and on your way to Bukit Sipolha, you may be interested to take a curious detour to a giant fish house. 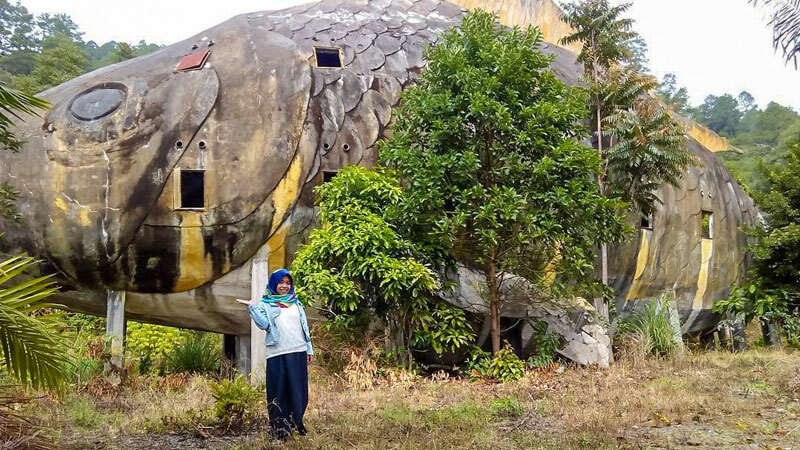 Commonly knowns as “Rumah Ikan”, the building is 20 metres long and 10 metres high! This place was formerly a restaurant, but the eatery struggled to survive due to a lack of customers, and it eventually closed. You may recognize the fish from the opening scene of the devastating film ‘The Act of Killing’ (‘Jagal’ in Bahasa Indonesia), when a group of Indonesian women danced down a red carpet through the fish mouth. The fish house is no longer maintained so it is now dilapidated. The interior is vandalised with graffiti, and the surrounding nature is starting to swallow the exterior of the fish. Isn’t it such a strange yet quirky location for some photo-taking? Address: Juma Harangan, Environment III, Kelurahan Sipolha Horisan, District Pematang Sidamanik, Simalungun Regency. Located around 15 metres from the main road Parapat-Simarjarunjung. 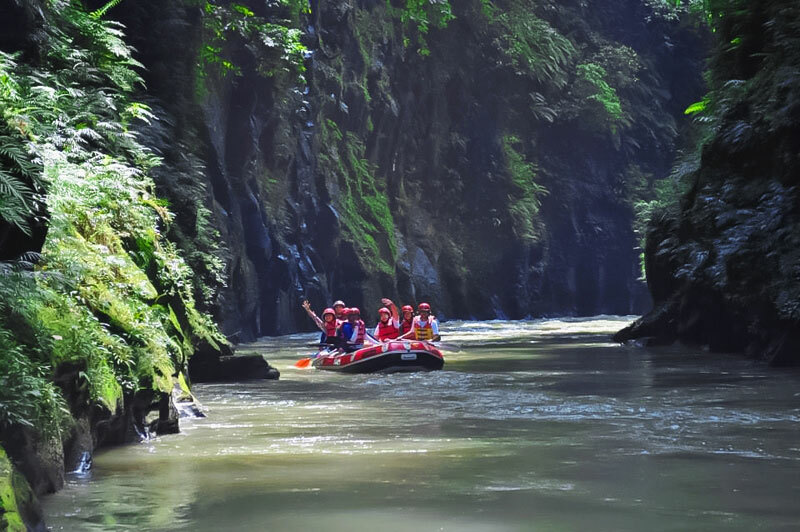 Rafting down Sungai Wampu is a truly special experience. 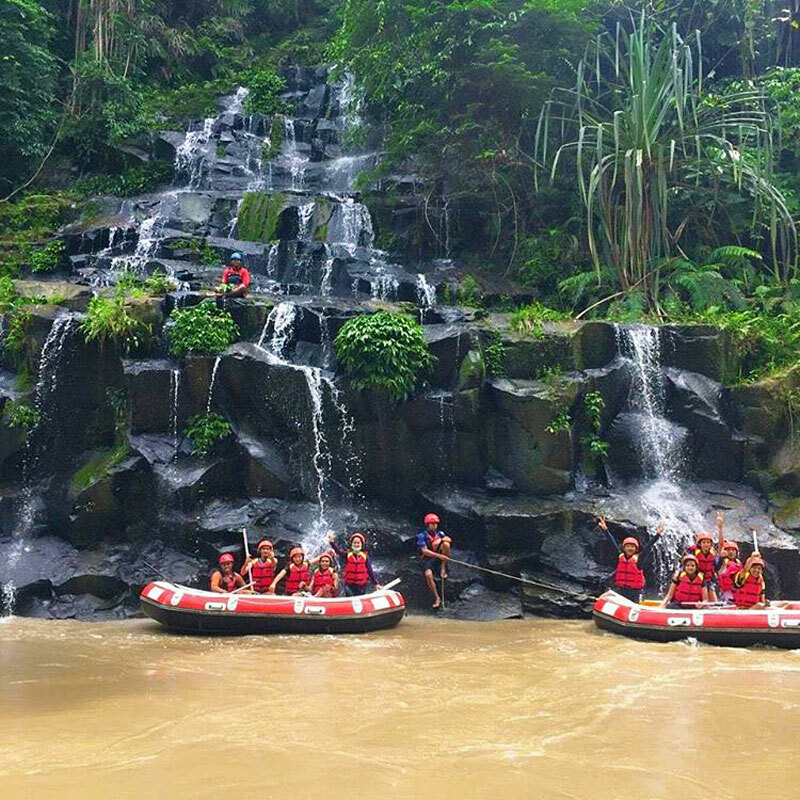 As you traverse down the river, you will get a glimpse into the Sumatran forest, pass by wildlife, encounter challenging rapids, and witness waterfalls and the stunning river valley. Won’t that be such an exhilarating and memorable experience? 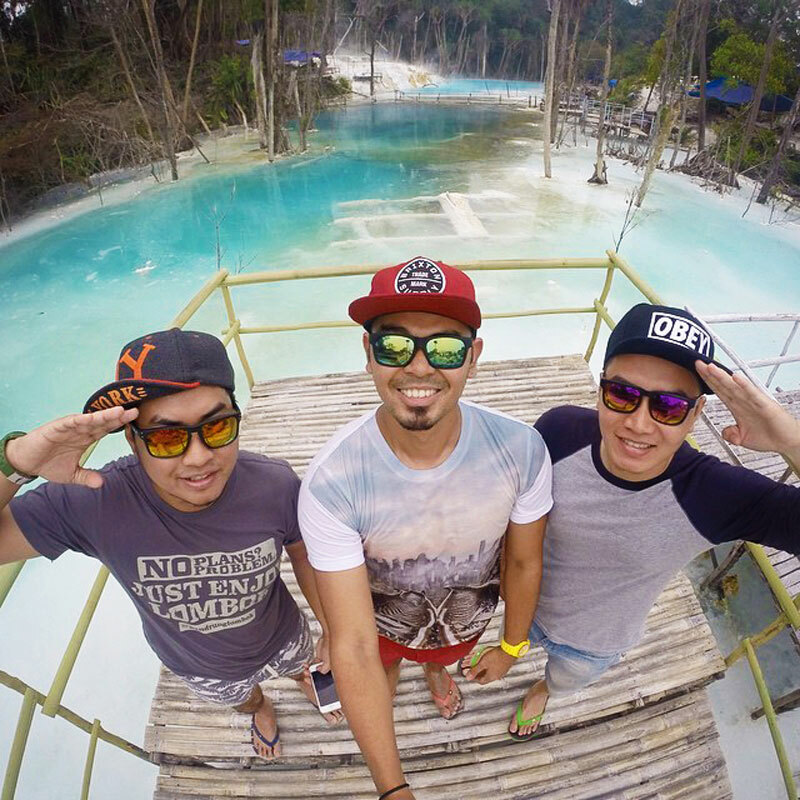 The rafting guides can’t promise you won’t get wet, but they can ensure that you’ll have fun! At the end of trip, reward yourself for your hard work by slipping into the hot springs – one of the best ways to unwind! 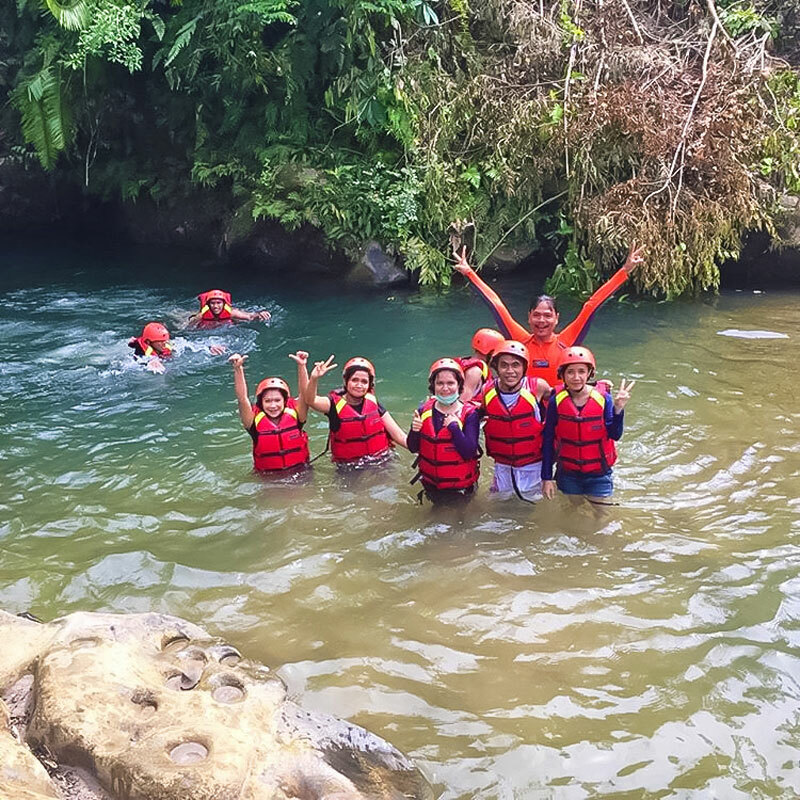 Getting there: It is recommended to start rafting from Maryke Village, which is 1.5 – 2 hours’ drive from Medan city via Binjai. Snap your Instagrammable shots on a hot air balloon platform, or on a giant hand or heart suspended above the scenic beauty in the skies. 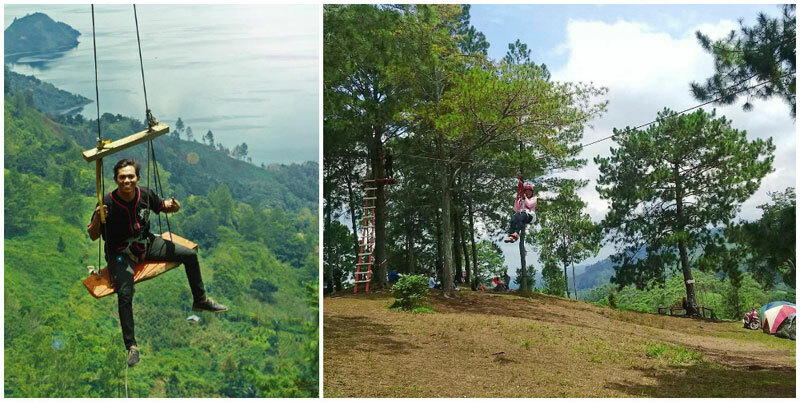 If you’re brave enough, take the treehouse swing into the clouds! The best times to visit Bukit Indah are in the mornings and evenings. During those times, you’ll have great lighting for photography, and a chance to watch the sunset over the lake. Keep in mind that it is cooler up there, and the weather changes quickly, so remember to bring a jacket! Entrance fees: From Rp. 5,000 (approximately USD $0.38) for 5 minutes of photography, Rp.10,000 for parking. Address: Jl. Simarjarunjung, Parik Sabungan, Dolok Pardamean, Kabupaten Simalungun, Sumatera Utara. 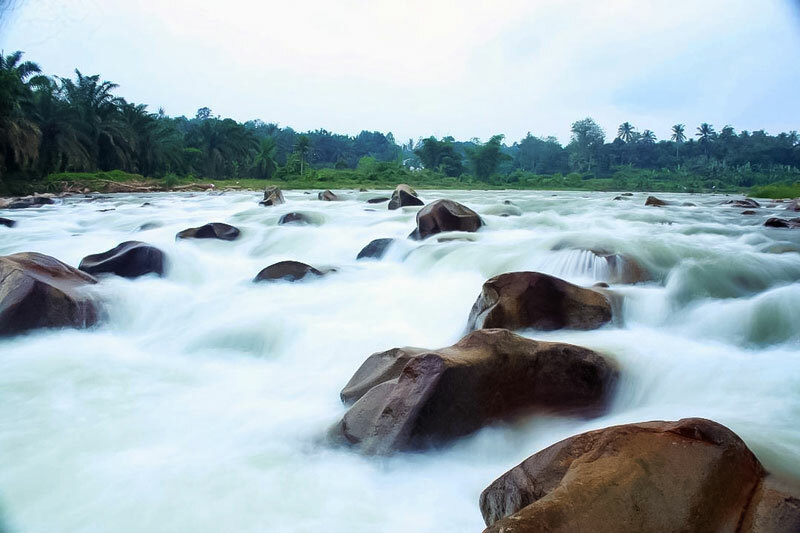 The Hulu River in Bukit Barisan Mountains is the mother of all waterfalls in the region. 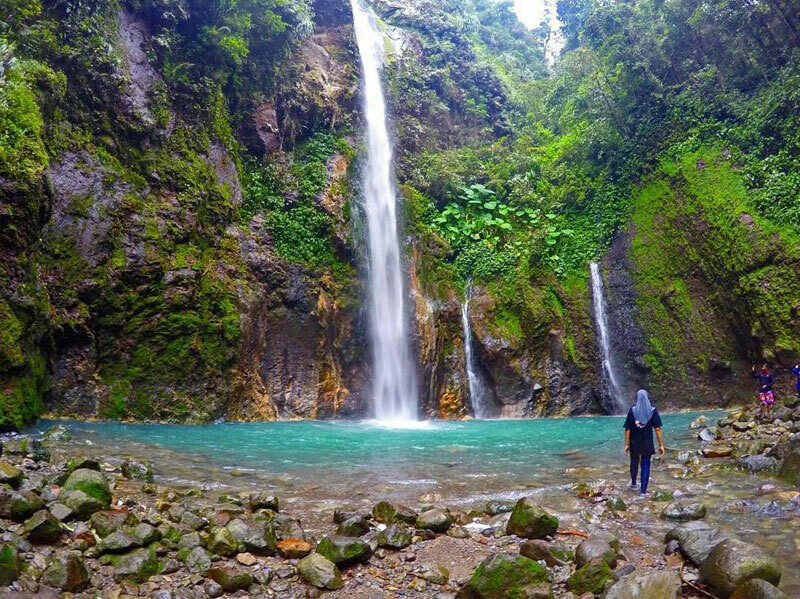 Due to the immense, steady flow of water that brings life to the Hulu River, three awe-inspiring waterfalls have formed: Simangande, Dua Warna, and Sampuren Putih. 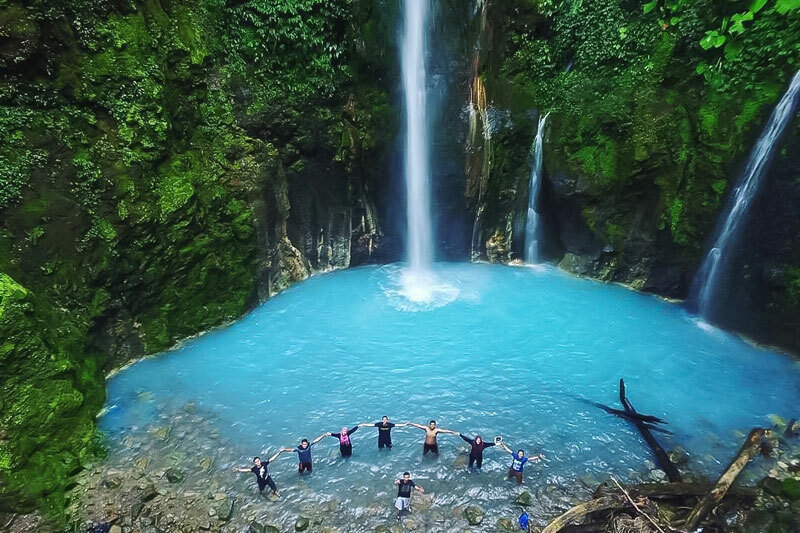 Each of these waterfalls is unique in its own right, and if you witness them personally, you will truly experience the full magnitude and beauty of these natural wonders. A quick caution for interested travellers: It’s not uncommon for heavy rains to approach suddenly. When storms are underway, it’s best to leave the area as the strength of the river during storms could carry you away. It’s hard to fathom a 500-metre-high waterfall that splits into two-tiers, but Simangande Waterfall is just that. As you stand before the mighty waterfall, you might start to get the sense that love is in the air. Could it be? Well, visitors of Simangande claim that there’s “waterfall love” here because of the heart-shaped rock that frames the waterfall. It’s quite a spectacular sight when you see it in person. 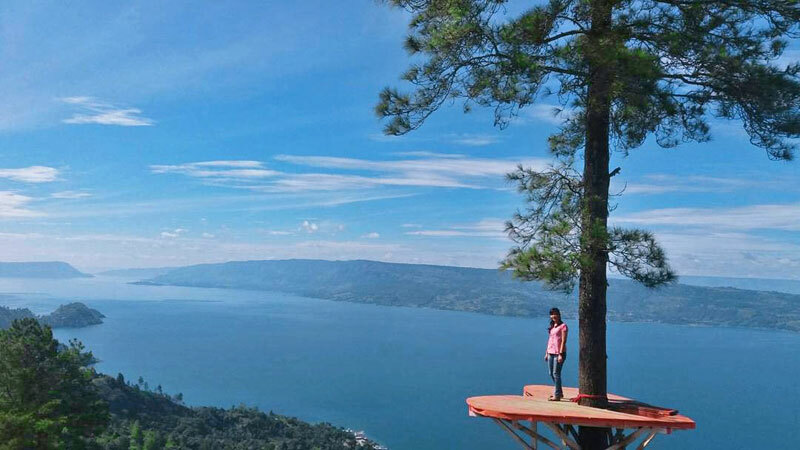 To top it off, on the eastern horizon you have an unobstructed view of Lake Toba, so if you come to see the sunrise you will be spoiled with a majestic view! 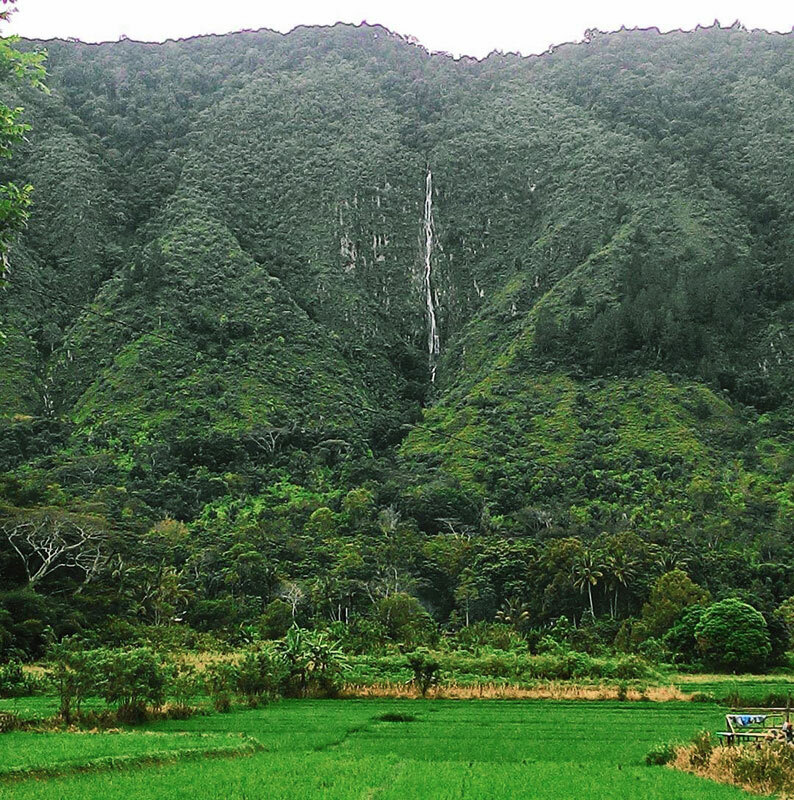 Take note that the waterfall only flows during the rainy season. 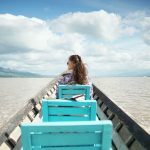 Getting there: Take a ferry from Parapat Harbor to Tomok Port on Samosir Island. After that, you can take a motorcycle taxi to Garoga Village and continue to this waterfall. 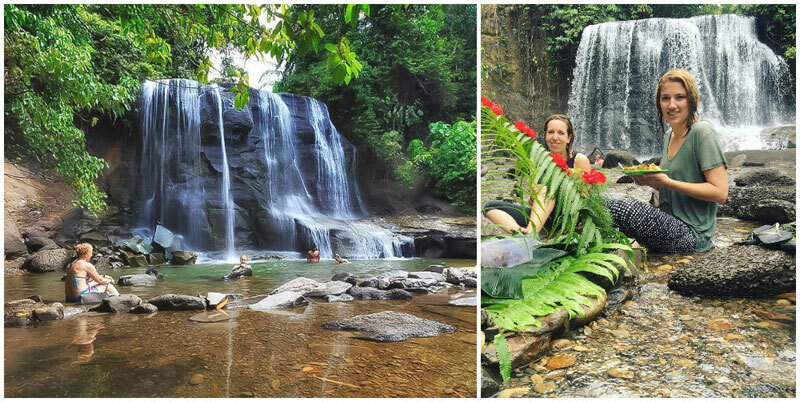 Travellers can also see the waterfall from Bukit Beta in Tuktuk Village. This could be one of the most intriguing waterfalls in the world. The Dua Warna Waterfall is comprised of two layers of colour – the water beneath is white-gray, whereas the falling water is light blue. Not only does the color diverge, but the temperature does too! You can expect the white water to be warmer – what a phenomenon! Standing at a height of 100 metres, the waterfall is at an altitude of 1,400 metres above sea level. 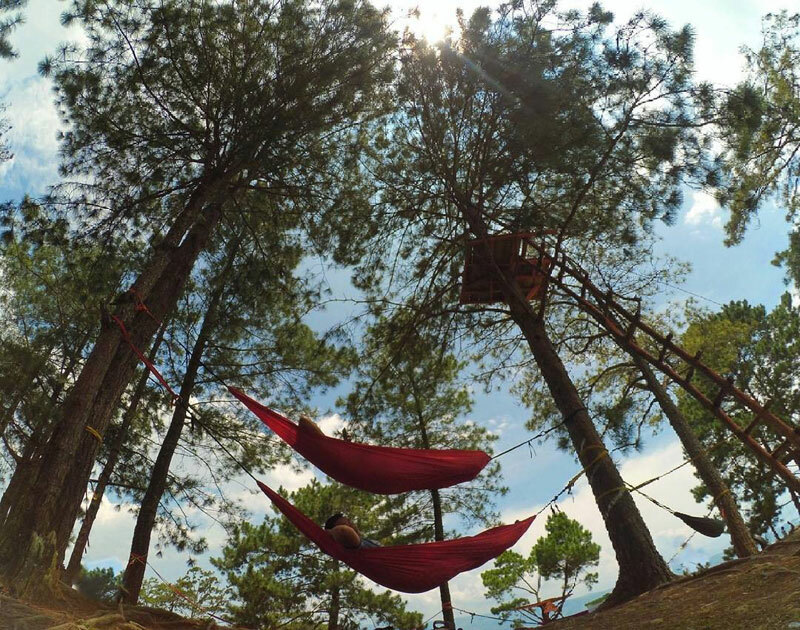 As it is surrounded by a high-altitude forest, you’ll feel like you are in another world altogether. Getting there: The waterfall is located near Jalan Raya Sidikalang in Medan. 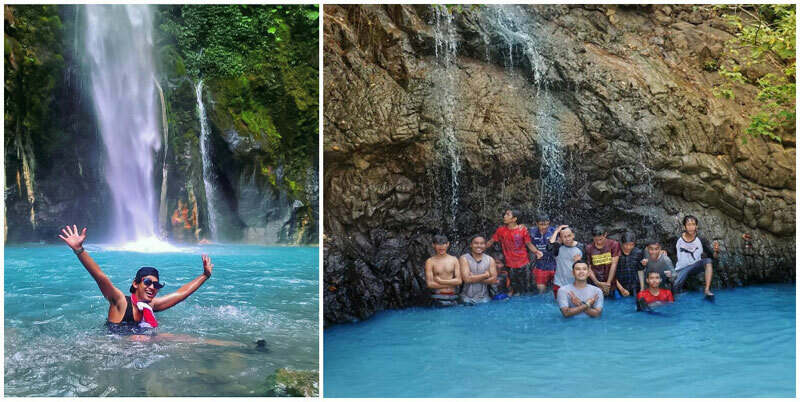 It can be reached within 2 – 3 hours’ walk from the main entrance of Sibolangit Campground. As the name implies, this is a seven-storey waterfall, with a height of 150 metres. The waterfall is a bit of a tease because at ground level, you can only see the last of the seven storeys. To view the other six levels, you must climb up the treacherous rock and forest terrain. If you’re not up for climbing up the cliffside, you can enjoy the single waterfall view from a shallow pool at the base. 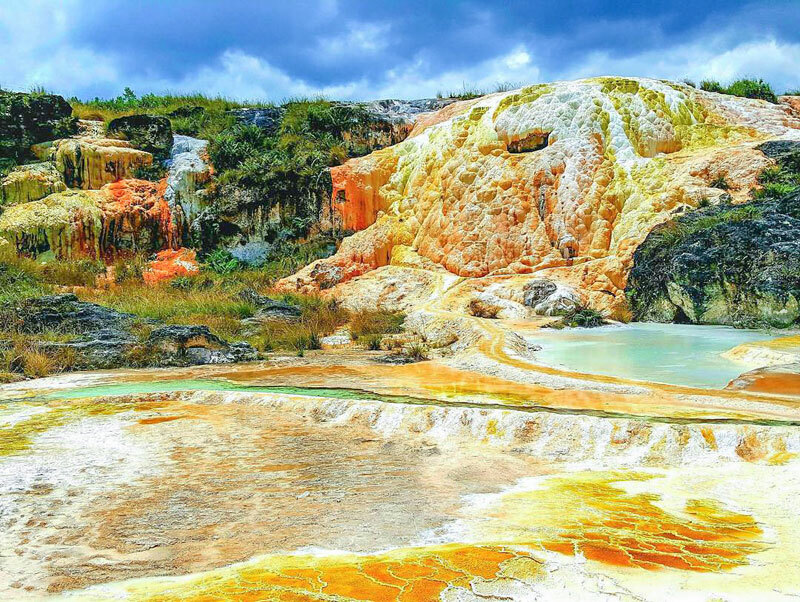 The pool is said to possess sulphurous properties, so as you soak and take in the beauty around you, your skin will thank you for the healthful sulphur bath. Getting there: From Medan, travel to Sibolangit area, followed by Simpang Bukum. Then, turn left and drive past Sikeben village, and subsequently drive past Martelu Village, Ketangkuhen Village, Sukamaju Village, Sanggehen Village, and you will reach Basukum Village. 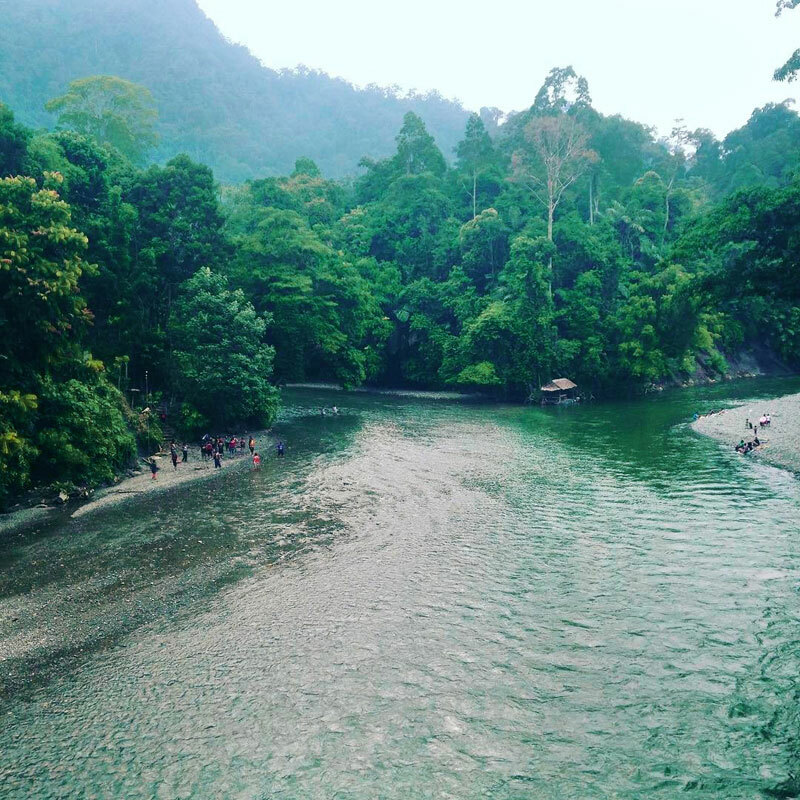 Originally established by a Swiss organization, Bukit Lawang is known as one of the leading protected habitat for orangutans. 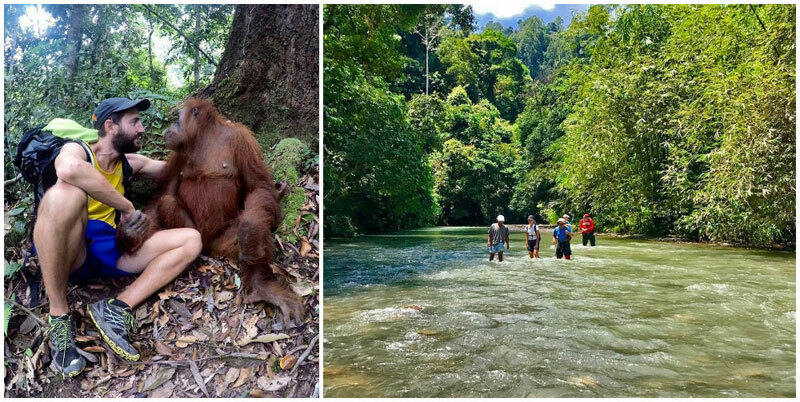 If you’re curious about our large, long-armed friends, Bukit Lawang is the perfect place to observe the behaviour of orangutans in their natural habitat. Just remember not to feed the animals, as human food can be poisonous for them! 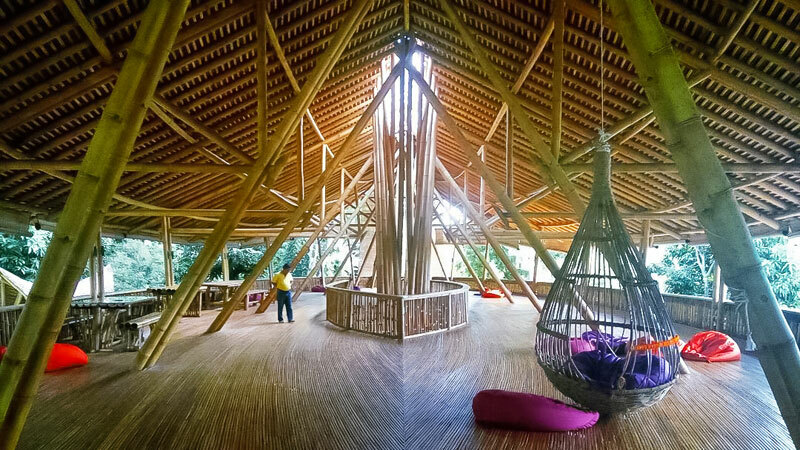 After a day of fun with the apes, consider heading to the Restoran Kapal Bambu (Bamboo Ship Restaurant), which blends seamlessly into the natural environment. Or are you travelling with a friend who isn’t interested in any monkey business? 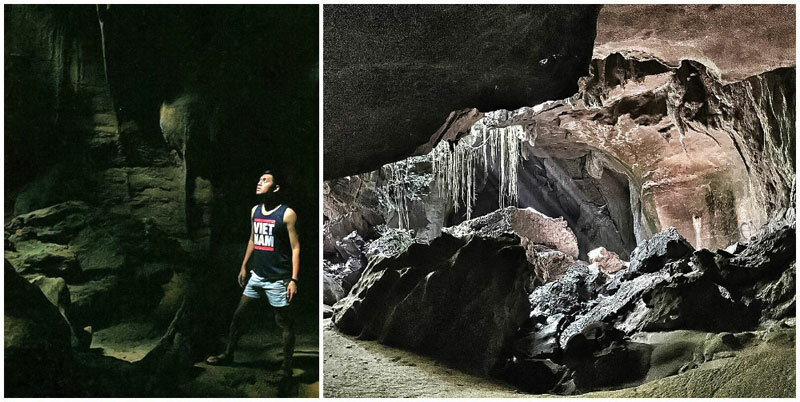 There’s a dazzling bat cave as well as tubing activities down the Bohorok River that you can experience! Getting there: From Medan, you have to pass through Binjai, look for Jalan Gatot Subroto and follow the road that leads to Jalan Binjai – Kuala. 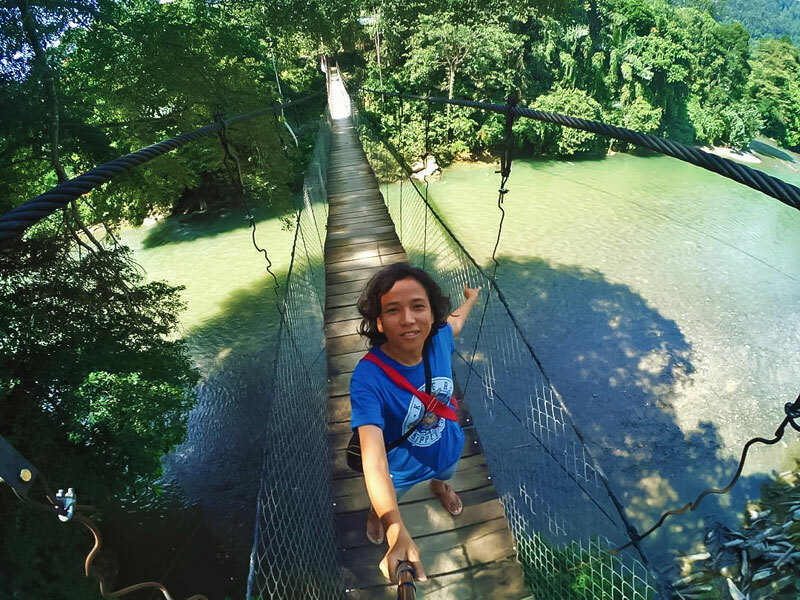 Keep going and you will reach Bukit Lawang. 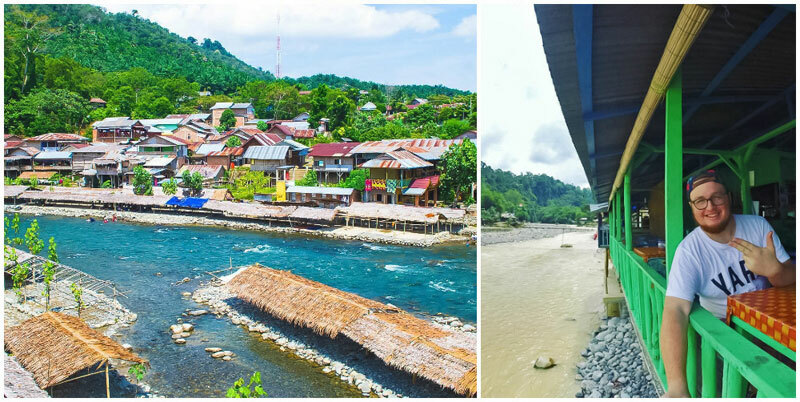 You can also take public transit from Pinang Lines Terminal to Bukit Lawang. 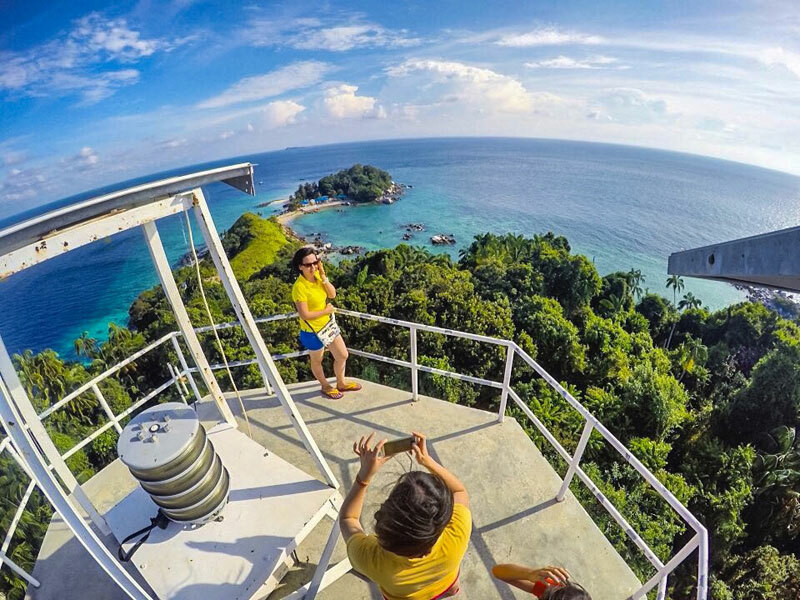 You may have seen this island in the Hollywood blockbuster ‘King Kong’. Mursala Island is a unique, tropical beauty situated in the Indian Ocean. Though it earned its famed through the film, Mursala is still pretty much peaceful and untouched. The marine biodiversity around Mursala is undeniably beautiful, but the greatest feature on the island is the waterfall that empties into the ocean from a 35-metre-high red granite cliff – isn’t it such a magnificent scene most people can only catch in the movies? Note: Do head to Mursala early and return to Sibolga in the afternoon, as there are no accommodation options available on the Island. Address: Tapian Nauli, Kabupaten Tapanuli Tengah, North Sumatra. 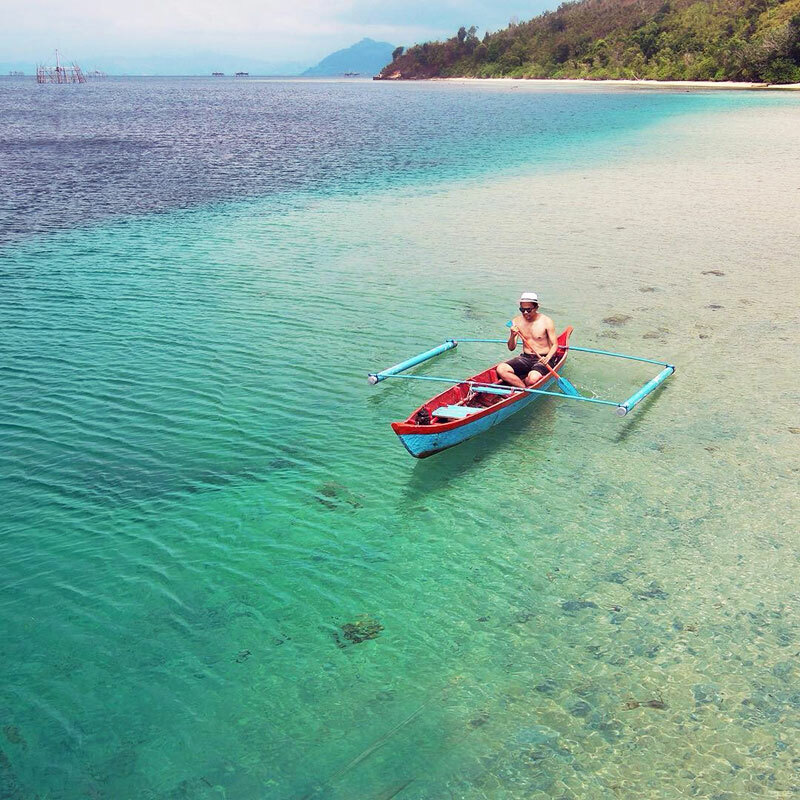 Getting there: Find a timbre boat rental or speedboat rental at Bosur Beach or Kalangan Beach to visit Mursala Island. 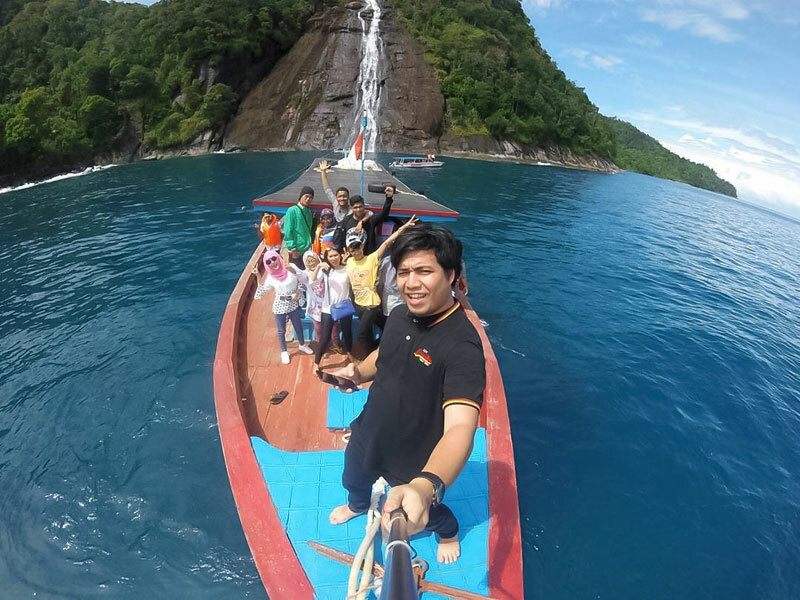 Traveling to this island takes about 3 hours by wooden boat or 1 hour by speedboat. Another option is to follow the minicruise from Naulicruise. 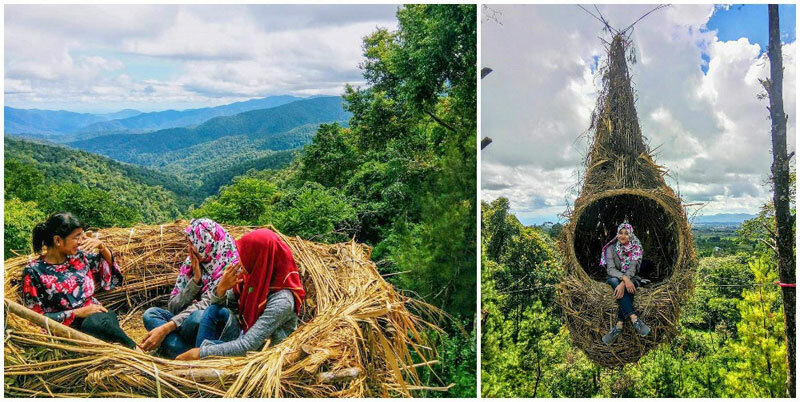 With the rising popularity of Instagrammable platforms, you may have seen similar nests and viewpoints like these before. 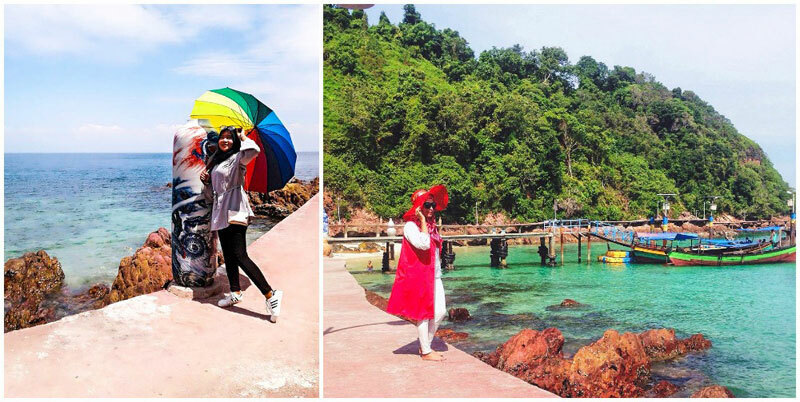 Located near Nantampukmas Hotel, these cute photo spots will delight you as you enjoy the view and snap away. Have you ever wondered what it feels like to have a nest high up in a tree, a place where you could look out over the world? 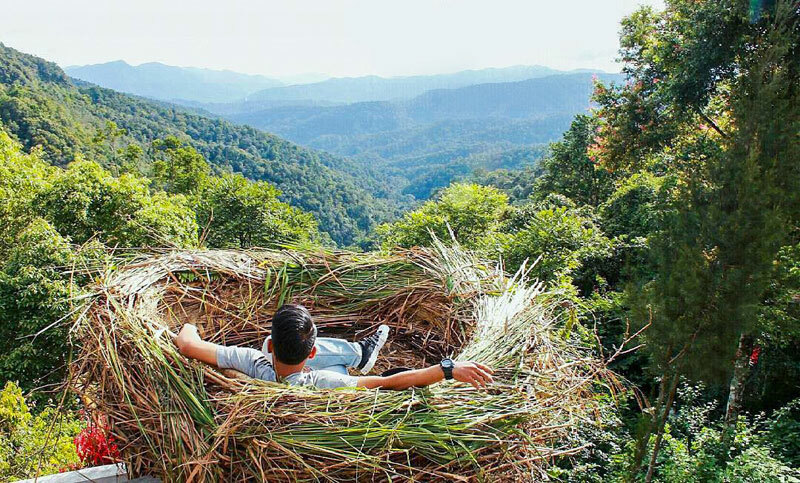 Step into one of these human-sized nests! 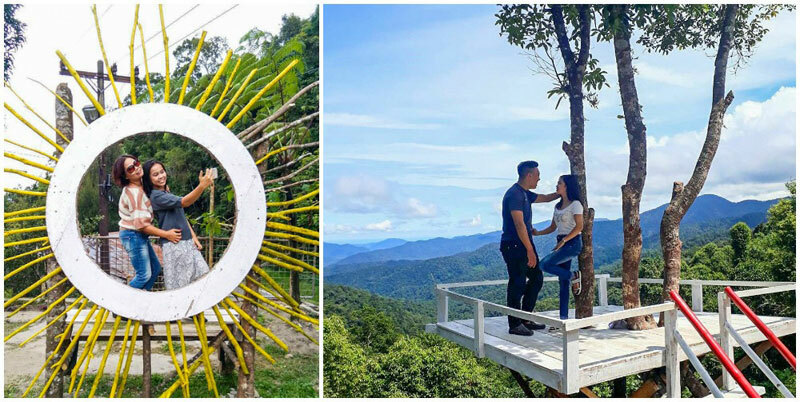 There are also platforms with hearts and sunbursts – all before the panoramic scenery of Sidangkat. 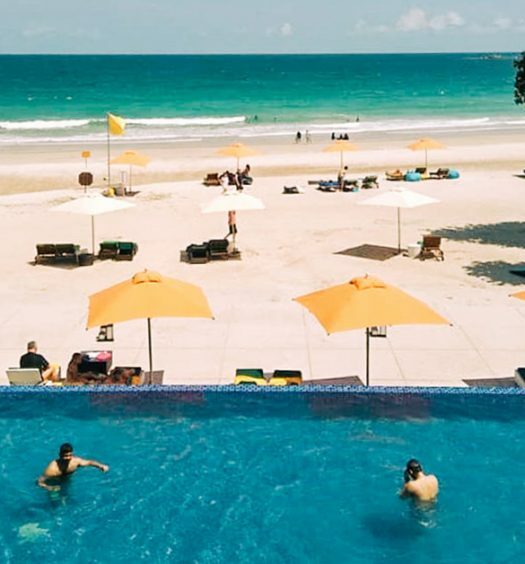 Have we tempted your wanderlust? 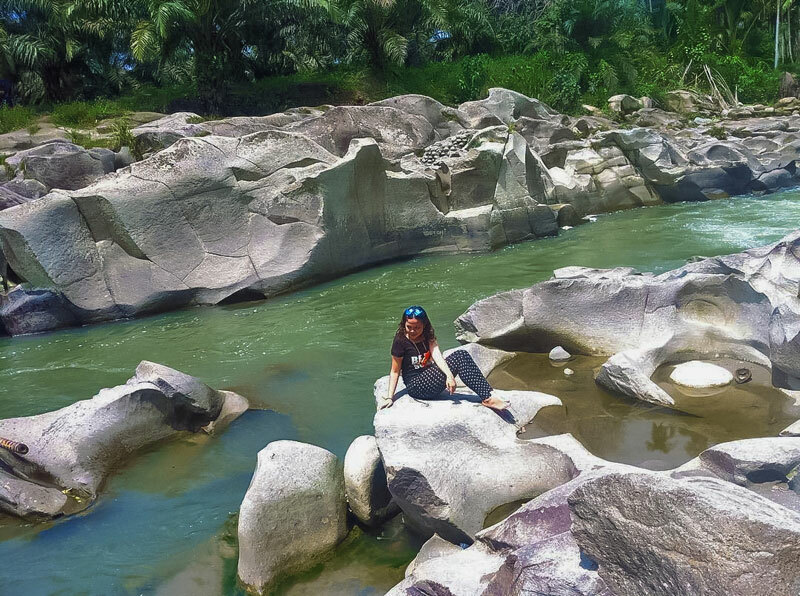 Do you know of any other hidden spots in North Sumatra? Do leave a comment and let us know! 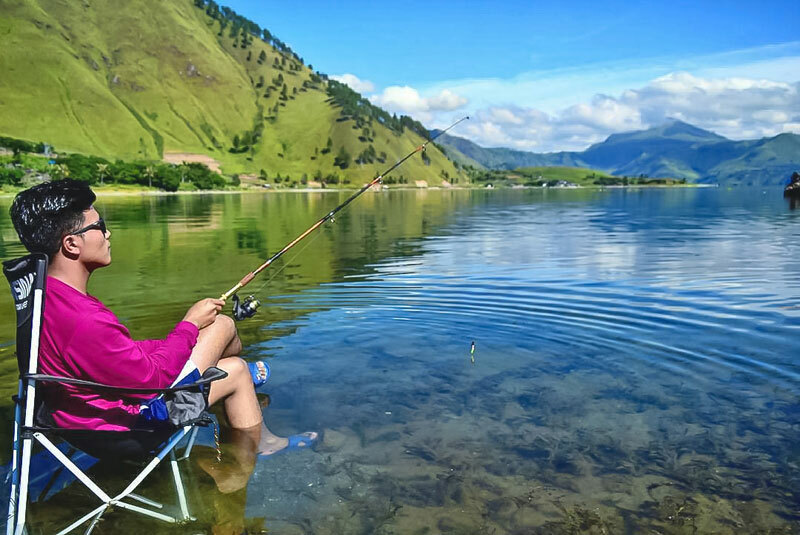 4D3N First timer best of Medan and Lake Toba itinerary with spectacular natural scenery and local street food!